Yesterday, I dropped by at George’s book signing in Ringwood. It was lovely to meet him, and sales were going well. George had a great display of posters with the Gamers’ Quest cover, a laptop showing the book trailer, and some freebies: bookmarks and stickers. Today, in part 3 of my interview with George, I ask him more about his book promotion plans, especially his online strategy. George also talks about his life as a writer. Will you sell or promote your book outside of bookstores? I’m happy to promote where ever I can. I’ve done talks and signings at science fiction conventions and at the Melbourne Science Fiction Club. Recently I did a reading as part of the children’s program at the Bright ‘n’ Sandy Food and Wine Festival. So if there’s anyone out there reading this, who would like to book me for a festival or school or library or whatever… drop me an email! Are there plans to sell your books overseas? My publisher has the book with an overseas rights agent. So it’s a matter of wait and see. 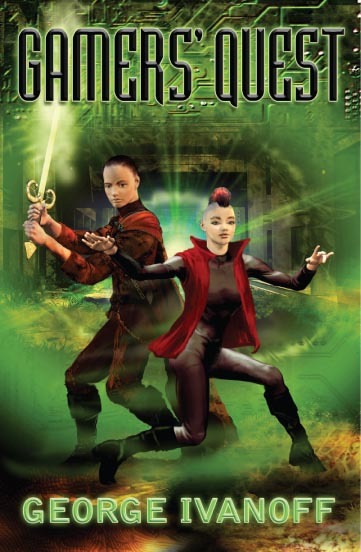 If there are any o/s publishers reading this who would like to bid huge sums of money for the right to publish Gamers’ Quest in their country, please contact Ford Street. How did you decide on the elements of your online strategy? It was a matter of doing whatever I could do myself and whatever I could get other people to do for free. Back when I had a real job, I used to work in web development, so I was able to put the website together myself. Unfortunately my skills in that area are sadly out-of-date — so the website is put together in rather old-fashioned way. But it works! The Gamers’ Quest theme music was composed and performed by my brother-in-law Marc Valko, member of the Melbourne band Thrashing Zombies. I was going to do the book trailer myself, using my very limited knowledge of the web animation program Flash. My first attempt was pretty crappy. Then my friend, H Gibbens, stepped in and saved the day. He’s a CG animator… click here to check out his website. I wanted a book trailer because I wanted to pursue as many promotional avenues as possible. And I like watching book trailers… so I assumed there must be other potential readers out there who also like watching book trailers. The book trailer was entirely conceived and made by H Gibbens. He read the book, then came up with a script and story board. I was happy to leave it in his hands. He thinks in a very visual way and I trusted his judgment. How did you decide what content to put on your website? I just asked myself what sort of info I’d want from a website about a book I was interested in… and that’s what I put up. Then my publisher suggested I should include some short stories. That was a great idea. I loved the opportunity to revisit some of the characters from the novel. The website is mostly aimed at potential readers — kids and teens — hence the colour and movement and sound. Time was pressing, so I didn’t end up doing any research other than testing the site out on some kids I knew and then modifying it accordingly. How are you integrating your online promotions with your ‘real world’ promotions? All the bookmarks include the website address. Every time I do an interview or write a guest blog, I mention the website. And on the website, I announcement any upcoming events and signings, as well as quoting a whole bunch of reviews. Do you market yourself to teachers, librarians or any other groups? Not as much as I should be. It all comes down to a matter of time. I’m trying to promote while also writing and taking care of my two kids (I’m a stay-at-home-Dad). But I do send out promotional material to schools, especially those in an area I’m about to do a signing in. And my publisher has sent out a huge amount of material to libraries all over the country. Did you write the teachers’ notes for Gamers’ Quest? Yes. I’ve done quite a few writing workshops in schools, which has given me a bit of an insight into the way a book can be used in classroom discussions. I applied this when writing the notes. Are you a full-time writer? How do you structure the days that you write? I’m a stay-at-home-Dad, so I write around the schedules of my children. My eldest daughter is at school, but my youngest is still at home. So, apart from the one day a week she goes to childcare, when I have the whole day to write, I write during her nap times, in the evenings and on weekends. Sleep? Who needs sleep? How does your background inform your writing? In every way possible! How can you write and not be informed by your background. My opinions creep through, even when writing fiction. My likes. My dislikes. Certain characters are inspired by people I’ve met and certain plotlines are inspired by events from my own life. My very first book, a collection of short stories about high school, Life, Death and Detention, was heavily inspired by my school experiences. How would you describe your ‘brand’ as an author? What is it that differentiates you from other authors? I’m not sure I have a ‘brand’ as such. Writing for the education market means that I write a huge variety of stuff in differing styles. With my trade writing, I hope what manages to come through is a certain off-beat sense of humour… particularly in terms of character. Edgar the dragon, for example, from Gamers’ Quest. He’s old, grumpy and sarcastic, and married to an enormous, human-looking woman named Vera, who has a liking for interior decorating and floral patterns. 1. Be prepared for rejection! There will be a lot of it. 2. When you do finally get a book published, be prepared to promote it. When my first book was published I naively thought that was it — I went back to my computer and went on with my writing. Meanwhile, the book went on to get a couple of good reviews but languish, unread, on bookshop shelves. I stupidly though the publisher would do all the promotion. Experience has taught me that I need to get out there and promote. Which is exactly what I’ve been doing with Gamers’ Quest. George Ivanoff is an author and stay-at-home Dad residing in Melbourne. He has written over 40 books for children and teenagers. His latest novel, Gamers’ Quest, is currently in bookstores. Two of his books (Life, Death and Detention and Real Sci-Fi) have been on the booklist for the Victorian Premier’s Reading Challenge since its inception in 2005. Hi Sheryl, thanks for the feedback. It was a long interview, so hopefully some information emerged that will be useful to other writers. Your new book, Princess Clown, looks like a lot of fun.